David Teniers the Younger (1610–1690), Armida before Godfrey of Bouillon (1628-30), oil on copper, 27 x 39 cm, Museo Nacional del Prado, Madrid, Spain. Wikimedia Commons. The able-bodied Christians who have been banished from the city of Jerusalem, together with Sophronia and Olindo, are arriving at the nearby town of Emmaus, where the crusaders have also arrived, on their way to lay siege to the city. The crusaders camp at Emmaus at dusk. As they are doing so, two ambassadors arrive from the king of Egypt: Alete, and Argante the Circassian. They are taken to meet Godfrey, and Tasso devotes the remainder of the second canto to the discussions there. Alete very courteously and diplomatically invites Godfrey to call a halt to the crusade before he attacks Jerusalem. He warns that continuing on his current course could bring the king of Egypt against him, and united with the Persian and Turkish forces, he would be heavily outnumbered. In return for stopping short of Jerusalem, Alete offers a truce and free passage to safety. Godfrey politely rejects the offer, stressing how it is God’s hand that directs the crusaders. Argante is brief and blunt, and tells Godfrey that his rejection means war. When they leave, Alete returns to Egypt, and Argante to Jerusalem. That night, Godfrey and his army cannot sleep. The third canto opens at dawn of the following day, as the crusaders march onward, and get their first sight of Jerusalem, the Holy City. Within its walls, a sentinel sees the approaching army, first from the cloud of dust which it throws up as it moves closer. He calls the citizens to defend their city; the old, young, and those unable to help in the defence go and shelter in its mosques. Jerusalem’s ruler Aladine does his rounds of the defences, and calls for the company of Erminia, daughter of the dead former king of Antioch, who managed to flee to safety in Jerusalem when her father’s city fell to the crusaders. Mattia Preti (1613–1699), Erminia, Princess of Antioch (date not known), oil on canvas, 98 x 73 cm, location not known. Wikimedia Commons. 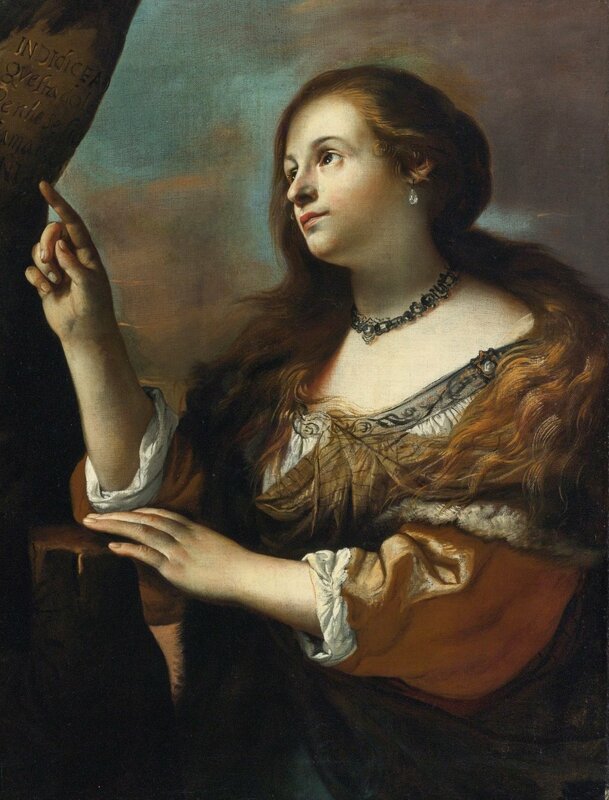 Mattia Preti’s Erminia, Princess of Antioch, painted in the middle of the seventeenth century, shows her exuding nobility, with shoulder-length hair. She is reading an inscription on a tree, which unfortunately isn’t intelligible. Clorinda leads the city’s troops out to attack the French crusaders, with Argante the Circassian holding himself in reserve in a secret gate in the city’s wall. Clorinda heads an attack on an advance party of the crusaders who have been sent ahead to scavenge for livestock and crops to feed the army. The captain of the city’s defenders is quickly knocked to the ground, but Clorinda weighs in and forces the French into retreat. They regroup on a hill, just as Godfrey sends Tancred and his troops in to support them. Aladine is watching this with Erminia alongside him, and asks her to identify Prince Tancred from her experience at Antioch. Erminia cannot reply, as she chokes back tears, but finally tells Aladine of her desire to make him captive for her “sweet revenge”. 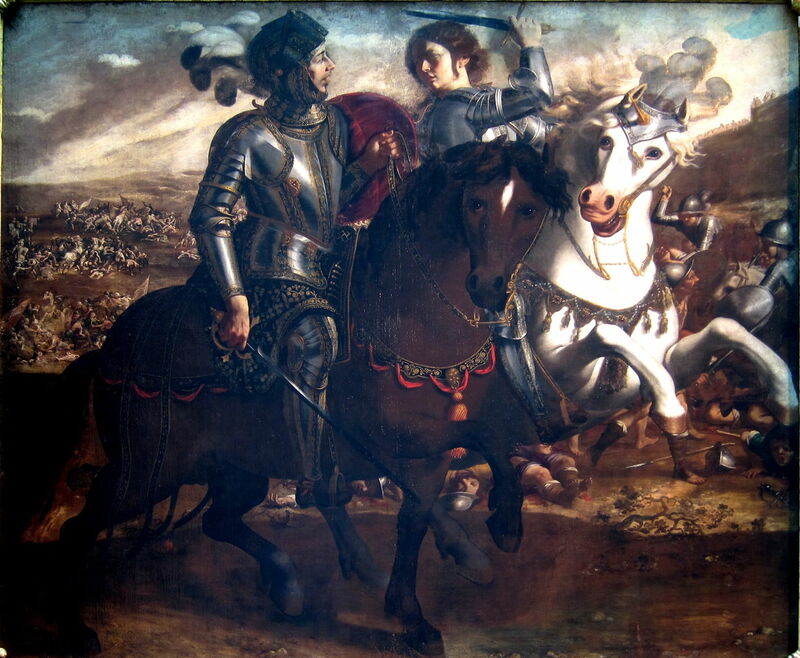 On the battlefield in front of them, Clorinda and Tancred charge at one another. Their lances strike the other’s visor and shatter, but Tancred’s blow knocks Clorinda’s helmet off, revealing her long, golden hair. Tancred is thunderstruck by this revelation. She charges at him a second time, but he turns away and attacks others with his sword. She chases after him, brandishing her sword and calling for him to turn and fight her. He refuses to respond to the blows from her sword, but calls on her to settle the matter away from the main battle. He then asks her to agree the terms on which she fights. He proposes that she should remove his heart, drops his weapon, and bares his chest to her. Paolo Domenico Finoglia (1590–1645), Tancred Faces Clorinda (1640-45), media and dimensions not known, Palazzo Acquaviva, Conversano, Italy. Wikimedia Commons. Paolo Domenico Finoglia’s painting of Tancred Faces Clorinda from 1640-45 shows this tense moment, when Tancred, his sword held low and away from Clorinda (who surprisingly has dark brown hair), makes clear his love for her. The battle rages on behind them. Elsewhere, the crusaders are getting the better of the soldiers of Jerusalem, and the latter are starting to retreat to the city. One of the crusaders prepares to strike Clorinda from behind with his sword, but Tancred parries it away. It still strikes her neck a glancing blow, and blood from a small wound starts to colour her blonde hair. Clorinda seizes the opportunity to run back to her troops and join their retreat. As the city troops reach the walls, they stop and wheel round to attack the rear of their pursuers. At the same time, Argante sends a small team out to attack their front. Argante leads them, and he and Clorinda start to gain victims from among the overreaching crusaders. These are from Dudon’s ‘Adventurers’, with Rinaldo in the lead. Erminia tells Aladine about Rinaldo’s great skills in battle, and then points out their leader Dudon, and Gernando, brother of the king of Norway, and a married couple, Edward and Gildippe, who always fight side by side. Johann Friedrich Overbeck (1789-1869), Argante, Rinaldo and Clorinda in Battle (1819-27), fresco, dimensions not known, Casa Massimo, Rome, Italy. Image by Sailko, via Wikimedia Commons. 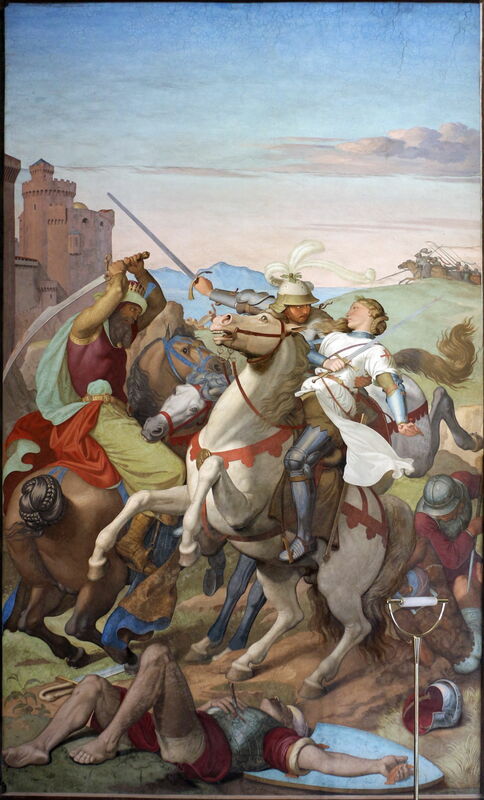 Johann Friedrich Overbeck’s fresco of Argante, Rinaldo and Clorinda in Battle (1819-27), in the Casa Massimo in Rome, may show another scene from this battle, although here it would make more sense if the unhelmeted Clorinda were with Tancred rather than Rinaldo. Another puzzle is the white smock worn by Clorinda, which bears the red cross of a crusader. Rinaldo and Tancred now break through, and Rinaldo strikes Argante so hard that he can barely get up again. Rinaldo’s horse is then struck, and he is forced to pause while he extracts his foot from underneath it. The remaining city troops make the safety of the walls, leaving Argante and Clorinda to guard their rear. Dudon presses on, killing four of Argante’s men and threatening Argante himself, who manages to sink the blade of his sword deep into Dudon’s body. Argante doesn’t hang around, but gets back to the wall, as the citizens start hurling rocks and loosing arrows at the crusaders. Rinaldo, free at last from his horse, is fired by the death of Dudon, and charges at the city troops despite the hail of rocks and arrows. He and the other crusaders pull up short, and they too turn away from the fight, recovering the body of Dudon on the way. Godfrey has taken the opportunity to study the city and its defences, and notes that its approach is difficult on three of its four sides, but easiest from the north, where it is most strongly fortified. As he is weighing up where best to pitch camp, Erminia points him out to Aladine, who recognises him from a meeting when he was an Egyptian diplomat to the court of France. Also identified, standing next to Godfrey, is his brother Baldwin, and on his other side Raymond, William son of the king of England, and Guelph, but Bohemond (who killed Erminia’s family) is nowhere to be seen. Godfrey decides that, as he has insufficient troops to encircle the city, he will station them at all its points of entry, and that they will dig in, using ditches to prevent surprise attacks. He then goes off to join those mourning the death of Dudon in the dark night. Overnight, Godfrey makes further plans. Recognising the strength of the city’s walls, he tries to work out where he can acquire timber to build siege towers. At first light, he joins Dudon’s funeral. After that, he has a Syrian take him to the only woods in the area, where he sets men to work felling those trees in preparation. That ends the third canto. The fourth canto opens with a long and florid account of pagan visions of the underworld conjured up in Aladine’s mind, and an accompanying speech by Satan to inspire the “pagans” of Jerusalem to defeat the crusaders. This leads to the introduction of Hydrotes, a “magician” who rules Damascus and its neighbouring cities, whose niece is the beautiful sorceress Armida. Jacques Blanchard (1600–1638), Armida (date not known), oil on canvas, dimensions not known, Musée de Beaux-Art de Rennes, Rennes, France. Image by Caroline Léna Becker, via Wikimedia Commons. 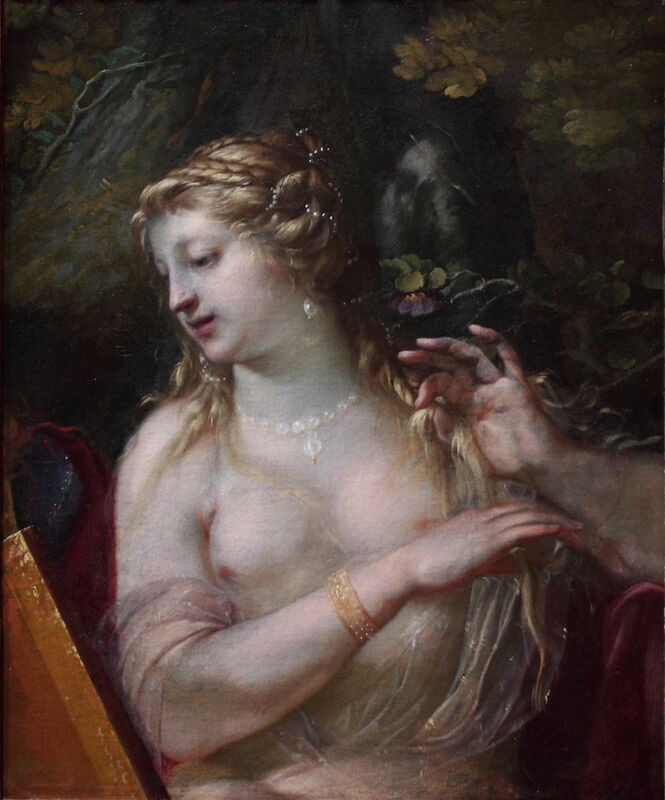 Jacques Blanchard’s undated portrait of Armida, probably from around 1630, shows her like Circe, dangerously alluring. Hydrotes sees Armida as central to his grand plan to defeat the crusaders, and directs her to the enemy camp, to win the warriors over, and make Godfrey infatuated with her. Armida rises to the challenge, and travels through the night to enter the crusaders’ camp. She quickly beguiles the men there, and can twist them around her little finger. Armida spins the crusaders a story of how she has fallen on bad times, and calls on Godfrey to shelter her. She bumps into his brother, and in no time is speaking with Godfrey himself. 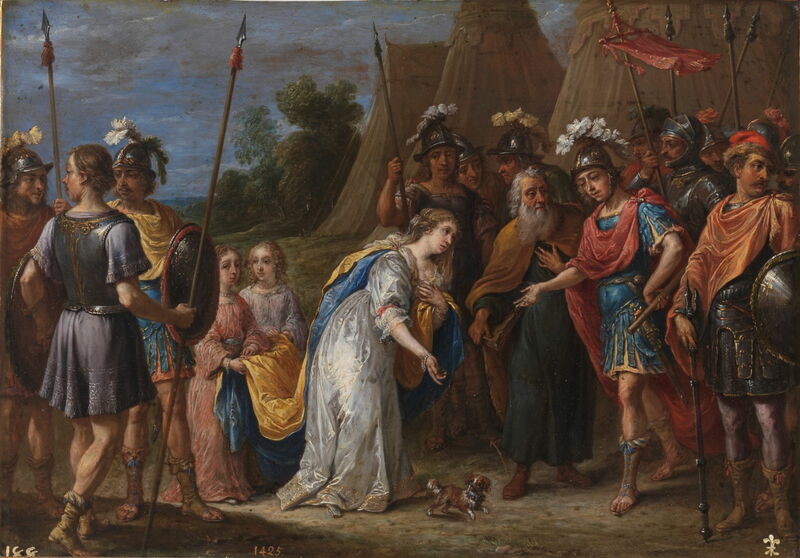 David Teniers the Younger shows this scene in this wonderful painting in oil on copper of Armida before Godfrey of Bouillon, from 1628-30. The sorceress is seen with a small lapdog and a couple of young maids, as might befit a contemporary woman of her standing. Next to the young Godfrey is Peter the Hermit, with his long white beard. After introductory flattery, Armida proceeds to tell Godfrey a long sob story, from the death of her mother just prior to her birth, to the threat of torture and death for her and her friends because she was alleged to have conspired to poison a tyrant. All she needs are ten of Godfrey’s best knights to go and sort that king out. Godfrey sat and thought about her request. Posted in General, Life, Painting and tagged Blanchard, Crusade, Finoglia, history, Jerusalem, mediaeval, narrative, Overbeck, painting, Preti, Tasso, Teniers. Bookmark the permalink.